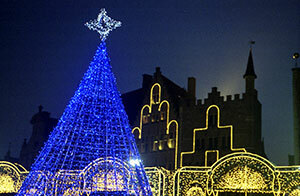 If you are thinking of taking a festive trip to Europe this Christmas, Bruges is only 90 minutes by helicopter from central London. Whether you’re interested in historic architecture, wonderful food or excellent shopping on the famous Christmas Market, there’s something for everyone in this beautiful and captivating Belgian town – and you can’t fail to get into the Christmas spirit! For more information and options call Atlas Helicopters’ Operations Team or get an instant estimate with the form below. 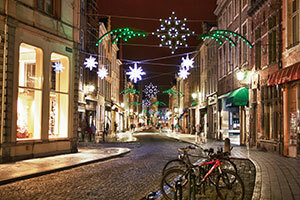 The charming Belgian city of Bruges is the perfect destination for a Christmas getaway. The combination of cobbled streets and winding canals sets an idyllic backdrop for the wonderful Christmas market, which runs from 21st November – 2nd January 2014. If you’re interested in visiting architectural sites, Bruges has a marvellous historic town centre and the Stadhuis along with the Basilica of Holy Blood are just two of the highlights. Another of Bruges’ most popular and more unusual attractions is the Luc Vanlaere Harp Concert, a free concert performed three times a day. Bruges is in the North-West of Belgium and only 15 minutes from the coast in the West Flanders province. And don’t forget the chocolate! With Atlas Helicopters you can charter a flight to and from Bruges in one of our luxurious aircraft and arrive in style. As well as the glamour, helicopter travel is fast and convenient, and with stunning views it’s a journey you won’t forget. You can go for a day or, if you fancy a weekend break there is plenty of space for luggage and up to 5 guests in one of our luxuriously furnished helicopters. We can even pick you up for your house if the lawn is big enough. You can also count on Atlas Helicopters to ensure your trip goes without a hitch. All accommodation and ground transport can be arranged for you, so the only thing you need to plan is enjoying your break! For more details on Bruges Christmas trips, call Atlas Helicopters’ Operations Team or get an instant estimate with the form below.